THE RESTORATION OF PUERTO RICO. Our commitment to the restoration of Puerto Rico has started with large-scale projects like luxury hotels to entertainment establishments such as theaters and gyms. Get to know Cotton. We are a leading company in offering support services to commercial infrastructures with agility and quality. We have always been driven by challenges. 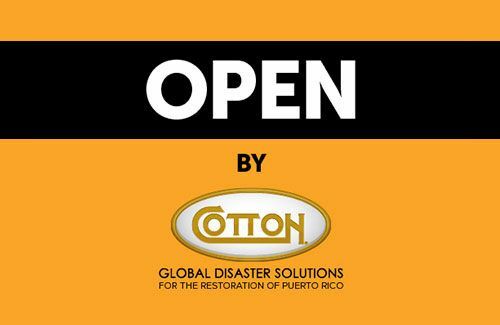 This is the reason why we have decided to establish ourselves in Puerto Rico to promote and contribute to its restoration 100%, with local talent, expert working knowledge and an honest corporate culture. Our main objective is to provide multiple services with the highest standards. WE ARE UNIQUE IN OFFERING TURNKEY SOLUTIONS FOR COMMERCIAL PROPERTIES. Our mission in Puerto Rico is to be the leading contractor that offers multiple services to our clients to reestablish business operations in the quickest and most efficient way possible. 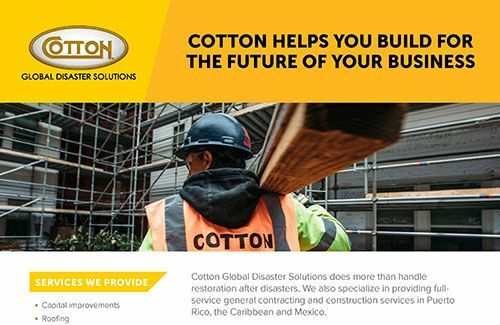 At Cotton, we are experts in the immediate response following natural or man-made disasters and meet the challenges involved with complex environments as well as large scale development projects. 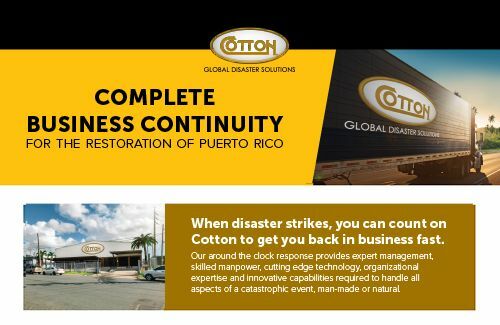 We offer turnkey commercial restoration solutions custom to each client’s needs in the United States, Puerto Rico, the Caribbean, Latin America and internationally. Water and fire damage restoration, structure cleaning, deodorizing, dehumidification, electronic and data recovery, cleaning and decontamination of HVAC system among others. General construction, structural repairs, mechanical, electrical and plumbing, code compliance, demolition and interior build-out among others. Disaster plan development, site improvement assessments, training, drills, and tabletop exercises, clerk services, estimating and loss evaluation among others. Mold remediation, asbestos abatement, spill response and clean up, forensic cleanup and chemical spill response and cleanup. Modular and fabric structures, mobile kitchen units and portable showers and bathrooms among others. Emergency food services and mobile kitchen units. WE BELIEVE IN IMMEDIATE ACTION.